FSI - Cornerstone University Women's Soccer - NorthPointe Christian Middle School -Working together to bring solar power to the Damou Christian Mission in Jacmel Haiti. Light bulb that when lit tells the mission they have power. When off, they must use the generator. Friendship Sports International is excited to be partnering with NorthPointe Christian Middle School and the CU Women’s Soccer team to raise money for solar power at the Damou Mission House and Headquarters in Jacmel Haiti. 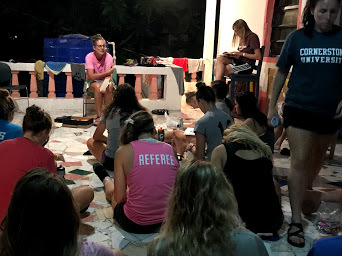 Recently the CU Women’s Soccer team traveled with FSI to Damou Mission on a mission trip where they worked at a VBS, a young mothers program, toured the mission and village, and served in a variety of other ways. Megan Willink-2002 CU Soccer/Graduate and current NorthPointe Christian Middle School Principal - led team devotions each night. NorthPointe Middle School Principal and 2002 CU Soccer Alum Meghan Willink was one of the leaders on the team. While they were there, they felt a strong connection to continue to support the mission once they returned home. The team and FSI will be sharing at NorthPointe Christian Middle School Spiritual Emphasis Week with the hope to raise funds and awareness about the needs of the Damou Mission in Haiti. Specifically they are raising awareness in child sponsorship which we will talk more about in a later blog and a solar power initiative. What does a solar power initiative mean for the mission in Haiti? Damou has $4000 raised and FSI has collected around $1000 in the past two weeks already. To get them off the grid with reliable energy, and provide the ability to increase their budget by $1300 a month we are hoping to bless the mission with another $5000 total by Thanksgiving. The money they will save monthly and can then be put towards the school and medical clinic as well as other mission needs. More information will be shared in the coming days. If you or someone you know is interested in supporting this cause, you can donate straight to FSI at the following link. There is a drop down menu where you can designate to the Damou Solar Power Initiative. Thank you for your support for FSI and for the Damou Christian Mission. If you are interested in joining us for future trips to Detroit, Haiti, Honduras or Guatemala - click the join us button to the right.